Today sustainability is not just a buzzword. Captains of commerce, like Wal-Mart, Target, Virgin, and Apple are championing the drive to improve the chemical footprints of entire supply chains. In the past, the word “sustainability” conjured images of extreme environmentalism at the cost of all else; today it encompasses a wide-angled view of the relationships between people, the environment, and commerce. Leading businesses, like those mentioned above, know they can draw a direct line between protecting the environment, protecting resources, protecting human capital and their bottom lines. Chemical substitution and greening of the chemical supply chain are tangible examples of how the sustainability movement is transforming the marketplace. Case in point, there is a quiet revolution happening in the United States (and globally) regarding the manufacturing, use, and commerce of hazardous chemicals and corresponding products. Recently, the European Union enacted regulations (e.g., REACH) requiring the registration of hazardous chemicals and the active search by companies for safer alternatives. 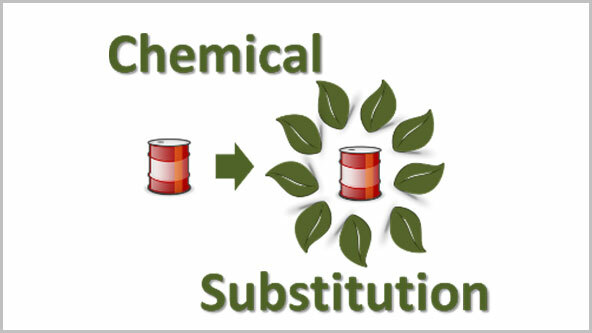 And here in the United States, many agencies and NGOs like OSHA, the EPA, NIOSH, BizNGO, and Lowell Center for Sustainable Production are calling on companies to take a proactive approach to chemical substitution. On its chemical substitution website, OSHA points out that a study by the University of California's California Policy Research Center found that annually, 190,000 illnesses and 50,000 deaths were related to chemical exposures. The writing is on the wall for those safety professionals looking for it, OSHA and other agencies are starting to bang the drum on chemical substitution. And when this happens, regulations are usually not far behind. In a recent guide to GHS adoption, OSHA mentioned in several paragraphs that the move to GHS styled formatting of safety information should assist companies in identifying their worst chemicals and finding suitable alternatives. Today, they are recommendations, but in the near future, they could easily be directives…especially if the marketplace is itself taking an aggressive stand against harmful chemicals. Technology can play an important part in helping companies through these key steps, particularly when it comes to identifying the most dangerous chemicals (or ingredients) in use within a facility or even across an organization. For instance, MSDSonline’s HQ and HQ RegXR Accounts have tools that allow users to search ingredient information on safety data sheets and to aggregate and track chemical information across the enterprise. A common concern businesses have in regards to sustainability and a focus on the environment is the cost such an approach has to the bottom line. Here too, a transformation is underway thanks to two key developments. First, many business leaders are throwing shareholder value to the side when it comes to taking actions they believe are the right thing to do for the environment. A number of CEOs have spoken up lately to say shareholders should sell their shares rather than pressure a company to be less sustainability minded. Second, research published by leading business publications like the Harvard Business Review, are showing that safety and sustainability are not cost centers, rather they are profit centers. Companies like Wal-Mart and Target are on the bleeding edge of this movement, and they are making moves based on the belief that being environmentally minded is good for business. By ratcheting up the requirements for their suppliers that products be free of chemical hazards to greatest extent possible, these retailers are responding to consumer pressure and changing the chemical landscape for everyone upstream in the chemical supply chain. As proxy season is upon us for publicly traded companies, shareholders would be wise to look at companies not only from a bottom line perspective, but from a sustainability one as well. They should ask, are the practices and policies of a company conforming to the environmental movements of the marketplace, because not doing so calls into question the sustainability of the company as a whole — a business lagging on the sustainability side of things is leaving itself vulnerable to new, holistic minded movers in the marketplace. Today sustainability is not just a buzzward, it is a lighthouse guiding companies and safety professionals to safe harbors.